Thursday along Bryant Way: A place to sit and watch cars go by? 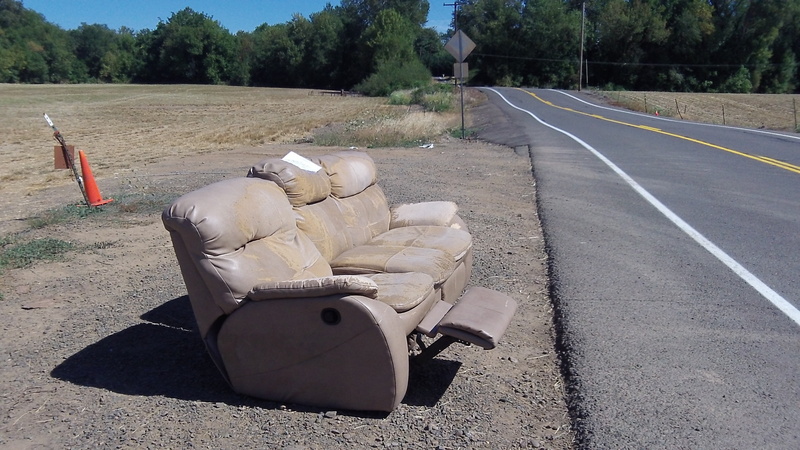 Here’s a new installment in the old story of bulky junk being dumped along our roadsides, or even in the woods. I looked at the “freecycle” site and didn’t find it helpful. Republic’s reference to “applicable charges” — that may be the rub. From the looks of that couch, I’m guessing its owners were not among the top 1 percent we hear so much about when the talk turns to “income inequality” and such. It’s likely they needed to get rid of this of this old monster and get rid of it quick, with no time to save up whatever it costs to have the disposal company pick it up. Once they got the thing on the pickup, they might have taken it all the way to Coffin Butte, a half-hour drive away, but again, dumping stuff at the landfill is not excactly cheap. So off to the side of the road it went.